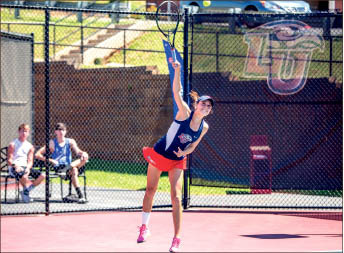 Liberty women’s tennis team fell short in the program’s first Big South Conference Championship against Winthrop, losing 4-3 April 18 at the Cook Tennis Center. Although Liberty won the first meeting earlier in the year, Winthrop won when it mattered the most improving to 20-5 on the season and dropping Liberty to 14-10 on the year. The Lady Flames took their excitement onto the court and started rough, losing the doubles point to Winthrop. But the Lady Flames did not back down from the moment and came out with fire in the singles matches. On court one, Liberty junior Maria Khval won 6-0, 6-3 with aggressive play to even the score for Liberty at 1-1. Rivera was the next to notch a point for the Lady Flames squad after beating Winthrop junior Caitlin Cridland in straight sets 6-2, 6-4 to take the lead for Liberty. Senior Valerie Thong stepped up when the team needed her to grab Liberty’s third point with her straight sets victory 7-5, 6-2. With the lead at 3-1 and courts two, three and five still playing, Liberty needed just one more point to become Big South Champions. Freshman Anna Dollar struggled on court two much of the match, but found some fight in the second set. However, she could not complete the comeback. 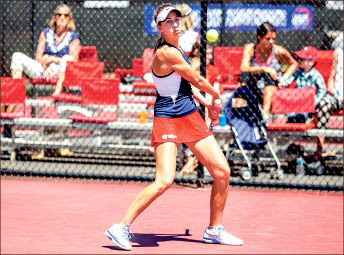 On the court next to Dollar, sophomore Evangeline Crist fought back and forth at the No. 3 seed before falling 6-4, 6-3, 6-2 in three sets to Winthrop sophomore Mariana Humberg. Maren got a bit of relief when Hassey took the first set 6-4 but then tension grew when Uzelac grabbed the second set 6-2. With Hassey serving for the match and the game tied at 30 all, Hassey rolled her ankle running for a ball and the crowd went quiet, but Hassey rose to stay in the fight. “My only concern was the she was going to lose her concentration, I thought that she would be able to fight through any pain,” Maren said. Hassey played through the pain to the end but never moved with the same mobility and eventually lost 7-5 in the third set. Maren reflected back on the season to the Lady Flames’ accomplishments despite having a sour ending to the season. After the loss, Maren told his team how proud he was of their play and gave credit to the good play of the Winthrop Eagles.